It’s been a busy week, asides from Brexit one of the big stories was the announcement that ISIS had finally been defeated, which is similar in concept to when their shoplifters were de-handed on many an occasion. 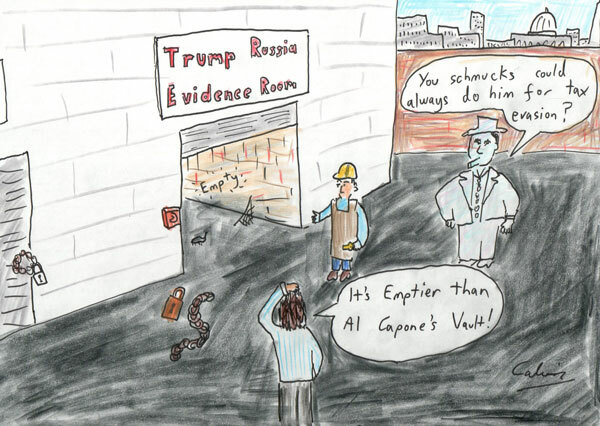 But the big story of the week was the completion of the Mueller Report which revealed that, drumroll please… Revealed that the past 2 years have been a complete waste of everyone’s time. It makes Theresa May’s 2 years in Brussels seem fairly productive in comparison; at least she achieved the goal of racking up enough airline points that she’ll be able to upgrade to first class long after she’s kicked out of politics. The lack of any damning conclusions hasn’t exactly gone down terribly well with President Trump’s detractors though, it's been a mix of glass half full, glass half empty and glass being smashed against the wall at the realisation that the president won, not because of a rigged election but because Hilary Clinton was a profoundly unpopular candidate. The conclusion of the report's findings is a bit like when people lobbied for the sequel for To Kill A Mockingbird to be released by Harper Lee’s publishers, and then the academic left went nuts when it turned out that Atticus Finch the lead character from the first book turned out to be quite racist in the second one. This whole investigation has been like the Hitler Diaries nonsense, or when they opened Al Capone's Vault which turned out to have been empty all along. But here we are, nearly 2 years after Mueller was named to oversee the investigation into obstruction of justice, collusion between the Trump campaign and Russia, plus anything else he wanted to really, I wouldn’t be surprised if the report contains a section determining whether the movie From Russia With Love is better than the original Ian Flemming novel? All we know is that President Trump, contrary to popular belief, was not scheming with the Kremlin. He was surrounded by scoundrels and his hangers on were about as trustworthy than a Scottish football coach who assures fans that they’ll win the world cup this time around. For now though, I’d recommend pouring a glass of something and sitting back while the Democratic presidential candidates for 2020 tear themselves apart over the disconnect between the narrative and the facts.